Feeling happy is important, it is what gives you the motivation to move forward in your life and head towards the goals that you inspire to reach. It is about putting those thoughts and feelings at the forefront of your mind if you are not happy you are not living a fulfilling life. Taking charge of your own feelings and ensuring that you are doing things that allow you to focus on the important things that you want to achieve and that helps to make you feel happy! Move forward towards your goals; don’t let fear or negative comments keep you from reaching your goals. Achieving these will improve your happiness and make you feel good too. Let go of those negative thoughts, they are holding you back from the life you deserve and what you want; it isn’t an easy task as many people hold on to the negativity to prevent them from taking the necessary steps to reach your goals and feeling happy. Let go of the grudges, I am not saying you have to mend any broken friendships, but you have to let go of the pain associated with those feelings, this can often make you feel sad and hold you back. It does you no favours in holding grudges. Always have things that you want to do planned into your life, it might be a favourite exercise programme a holiday or even just a treat. Forgive yourself for your past mistakes, it is in the past, you can’t go back and turn back time, move forward and take the steps to put your past behind you. Spending money isn’t going to make you happy, it can cause more worry in the long-term especially if you spend more than you earn. Learning what does make you happy is difficult, you might get a rush from spending money but in the long-term, you will come to realize this isn’t happiness. I think this one is key to happiness, know what money you have and what you have to spend and become debt free; it feels great and it makes you feel happy when you know that what you buy you pay for with cash and owe no big finance company any money. Acknowledge how you are feeling, by understanding what makes you happy and what makes you sad and if you don’t feel a 100% happy, then acknowledge your feelings and see if there is any reason as to your low mood. If you see a pattern, there might be a trigger for your mood and this will give you the tools to change how you feel about certain situations. Be grateful for what gives you pleasure, if you look for being grateful it takes the emphasis off the negative side of life. Keeping a journal can help with identifying those things that make you feel grateful as well as identifying those things that can change your mood; writing is a great way to get these thoughts off your mind and when you share them, even with a journal, it can help to make you feel happier. Have you heard of ‘faking it until you make it’? This concept does work, by pretending to feel happy until you feel happy. This isn’t a great idea if you suffer from depression, as this is how a normal day is, telling everyone that you are OK and in reality your insides feel like they’re being ripped out, with no compassion or happiness. However, if you can pretend to feel happy, you never know it might just work. Therefore, if you are looking to make you feel happy then you might try a few options from the above list, alternatively, if the sadness lasts longer than expected you might need to seek some medical help. Don’t feel this is letting you down in any way, you would seek medical attention for any other medical complaint so don’t feel that your mental health is worth anything less. 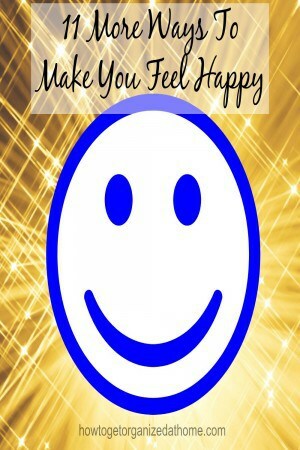 What is you best tip to help make you feel happy? 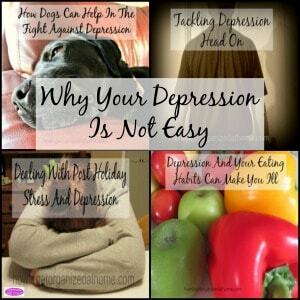 I wrote an article about depression and how this can affect how you feel, Why Your Depression Is Not Easy! Excellent list, Sharon!! Thanks for the reminders.